Boyapati Seenu is one of the few directors in Telugu who can strongly connect with mass audience. When critics rule out most of his films as ordinary and routine, the results will be completely opposite. It is known that he is presently directing young hero Bellamkonda Srinivas film. The filmmakers have revealed the title with a title logo poster today. 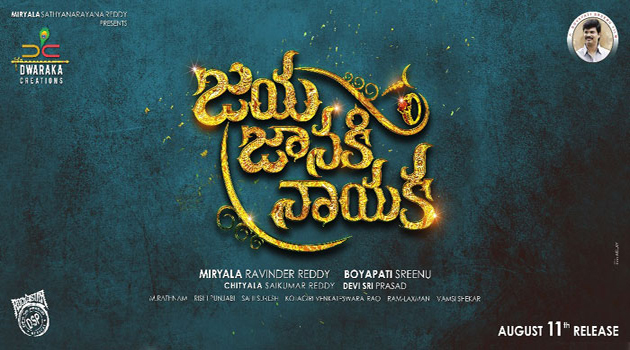 'Jaya Janaki Nayaka' is the title of the film and Boyapati has surprised everybody with the title. Boyapati continued the tradition of powerful titles... additionally he gave a traditional touch to the title this time. It appears that the title has a strong connection with the story. When the first look of the film was released six months back, it has received appreciation. Bellamkonda Srinivas appared in stylish avatar in the first look. Boyapati scored points again with the titlte also. Rakul Preet Singh, Pragya Jaiswal are the heroines. Catherine Tresa is doing a special song in the film. Jagapathi Babu and Sarathkumar are playing crucial roles in the film. Devi Sri Prasad is the music director. 'Jaya Janaki Nayaka' is slated for release on August 11.